Growing up as a child, most of girls dreamt of having a big wedding where the whole world would know that you have now found our soulmate. As you approach your special day, and the preparations for it are underway, in this digital age, it is becoming an increasingly important to get yourself a good wedding website design to help disseminate all the wedding-related information to your invites. Besides the website, there might be a million other things overwhelming you mentally, as well as financially. You might have imagined Maroon 5, John Legend, Chainsmokers or other famous musicians performing at the reception. However, not all of us can afford such expensive elements to be part of the weeding. The option available to most of us is to have a bargain wedding. Have in mind that inexpensive doesn’t always mean cheap. We spent some time researching this option, and we have come up with some ideas that will help you with the alternative to a big expensive wedding. Let’s get started. * Where the event will take place – look for places that do not cost (a lot of) money to use, such as a church, your home, or a sea shore that would definitely cost much less as compared to a 4 or 5-star hotel. * Who will be invited – always keep in mind those that really matter to you the most. If you can imagine your wedding without a particular person, they should not be on the guest list. When deciding on anything related to your wedding, always have your wedding budget in mind, and sit down with your partner to write down the list of the top 5 priority things on how the money would be spent. Remember, your aim is to have a money-saving yet great wedding. Besides the exchange of vows and the bride’s dress, one of the most anticipated aspects of a wedding, especially for the guests, is the food. You can still get a satisfactory catering services without necessarily having to hire expensive restaurants to do the work for you. Have your family or close friends sort out the catering for you. Alternatively, search for a family-owned restaurant in your neighborhood and ask them to do the catering for you. Family owned restaurants will actually go an extra mile to make sure you have a very memorable wedding while taking into consideration your budget limits, unlike corporate companies. Tradition has always dictated that before the wedding, couples should design wedding invitation cards, print them and mail them to the respective group of people. During the wedding, there ought to be a program card as many weddings dictate although it is not necessary. All this cost a lot of money but there’s one thing you have not considered. With the development of technology, it is not a must for you to go through a print media hassle for your message to go out. Everyone now has access to smartphones and computers. Simply get a good wedding website design, have all your information on it and send it to the invitees. During the wedding, you can have screens displaying the program instead of everyone having their own copy, which will be useless at the end of the day anyway. Having your guests entertained doesn’t really require a lot of dough. If you prefer live music, get yourself a local band which shouldn’t cost much. You can alternatively get a good local Deejay to turn the atmosphere of the party up. An MC too shouldn’t bother you much. Get your talkative friend(s) and let them show you their magic. There are some other fun games which can also involve the audience without necessarily having to engage the services of an expensive entertainer. Always remember that the wedding should not cost more than the marriage. Paris or Dubai doesn’t always have to be the perfect honeymoon destinations. You can visit a B&B somewhere chill, or a cottage; somewhere romantic, maybe by your nearest lake or river. It will bring much fun, yet you will have saved up a lot by doing this. A wedding is something that you’d want to make memorable. You should not compare yourself with other couples who have had a wedding before you with a bigger budget than yours, as you can have a great wedding yet less costly and even put some savings aside. 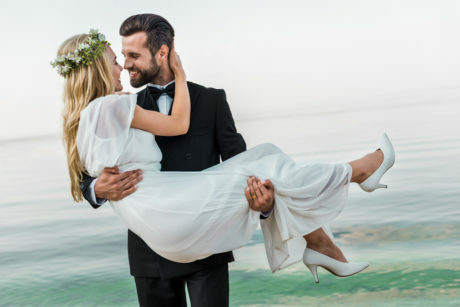 You can use the amount you will save by following the tips above to start an income generating activity since a wedding is just the beginning of your life together.